The chapters "Technical Notes" are designed especially for those who are more interested in the problem, or even want to investigate it on their own. All others can skip these chapters without disadvantage. Herein, we collected all the aspects, which we assessed to be too special for "A Summary of Our Solution" ( 19). Living with on the right side is possible, but not attractive, so pre-empts two eyes in the lower right corner. If connected with , , and , would come to life, capturing , and parts of . If captured , therewith connecting with , would capture in return, so getting sufficient local compensation. Thereafter, would attack on the left side, achieving life for all of her groups in sente, and winning the game with more territory than . Detailed explanations of Kang KyoungNang 7d on the very first moves can also be found in this book ( 802), as well as our variations on this topic ( 57). This diagram displays the position after our first variation for ( 57). 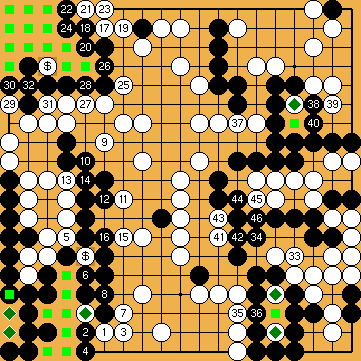 The board is still very open, so it seems to be very unlikely that "usual" Amateur's endgame will provide a reliable method to determine the game's final score. Thus we adopted - certainly imperfect - a procedure that Robert Jasiek has introduced in his book on "Territorial Judgement" ([LIT. 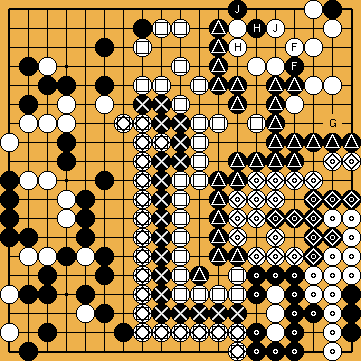 14]): One player reduces the opponent's potential territory from the outside, the opponent answers locally, and only the final opponent's territory is counted. We got 15 points in the upper left, 8 points on the right, and 16 points in the lower left; for a total of 39 points for . This is the correspondent determination of 's core territory. We got 9 points in the lower right, 10 points in the upper right, 15 points on the upper side, 1 point on the left, and 9 points on the lower side; for a total of 44 points for . 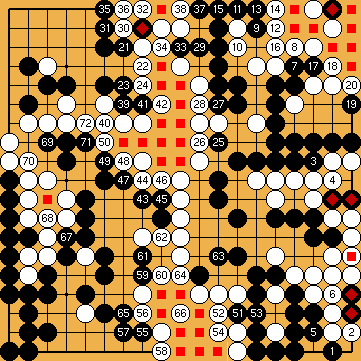 According to this rough calculation (= 44 - 39), White is ahead by approximately five points. The first throw-in at ( 917), as well as the second one at ( 914), are closely connected to some counter-intuitive effects, which are explained in detail in a separate chapter ( 909). 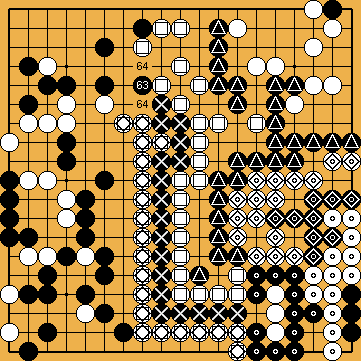 The first throw-in is mandatory with the classical solution only, wherein the guzumi in the top right corner is not played. The second throw-in has been assessed over decades to be the coffin nail to an unspecified semeai, or at least to lose points, but these assumptions will turn out to be not correct approximately 150 moves later. It would be still "Early life without real benefit" to attempt getting life with at (followed by , , , and ). will play , capturing , and eventually also , so winning the game ( 103). Because of the "extra" liberty at , cannot safely capture with a move at . However, at any time from now on, can choose to do so. If she does so now, then she will lose / , and so the game. - by attacking , , and - will try to force to capture . 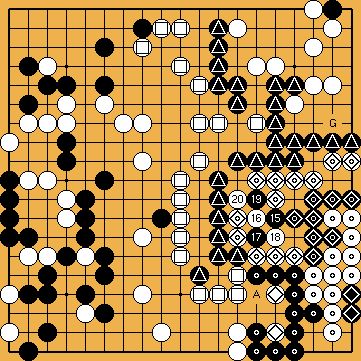 The converse of this is that if can somehow make take off the board, then he can (probably) save - this becomes clearer after Tec III.7 ( 499). Before capturing , must wait until it is profitable, if ever. Later, will add to, and then repeatedly sacrifice, . We devoted a separate chapter to explain the special characteristics of "hanezeki" ( 1111). Let us go two moves back. Near the end of the tail-building sequence might consider to hurt 's shape on the upper edge with the move of here. However, after long thought, has to accept that this manoeuvre will not benefit him - provided that answers correctly with a move from above. But, if mistakenly cuts from below at the alternate , there is a further, unexpected, possibility for 's life - a Circular Hanezeki ( 799), involving all the groups , , , , , , , , and ! Our variations on this topic can also be found in this book ( 133). The reduction of 's upper right corner starts with . This move is also played in the classical solution, although at a different moment of the sequence. We think that will not benefit from trying to avoid answering with ( 169). The very special idea (developed by Harry Fearnley) now is the hasami-tsuke of , followed by , , and . 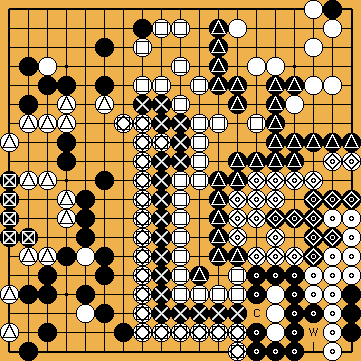 This move does not have any effect on the final score - unless the guzumi of is played before or after (which is preferable). 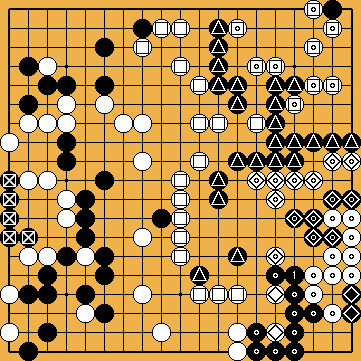 In this case, the hasami-tsuke steals four points of territory, giving a more comfortable win than without. More detailed information can be found with the topics "history" ( 790), "conjunction with the guzumi" ( 898), and "approach-move liberties" ( 1098). We will continue with part II of the "Technical Notes" later ( 183).